← The Paris postulate: the hidden assumption in the latest climate accord. “The federal budget is a policy statement.” – widely-quoted Washington aphorism, of unknown origin. “Here’s the way to look at the budget. Next year is a disaster. This year is better than we thought it would be. Last year is the best year we ever had … and it’s a sliding scale.” – Robert Alvis, Boulder-based NOAA budget analyst, ca. the early 1970’s. Recent language in several House and Senate authorization bills has suggested limiting federal agency budgets in the geo-sciences. (With considerable oversimplification) a variety of different rationales have been invoked, depending upon the targeted agency: relative contributions to innovation (NSF); the priority of earth sciences relative to planetary exploration (NASA), and Congressional desire to focus on improved weather forecasts at the expense of funding for climate research and services (NOAA). 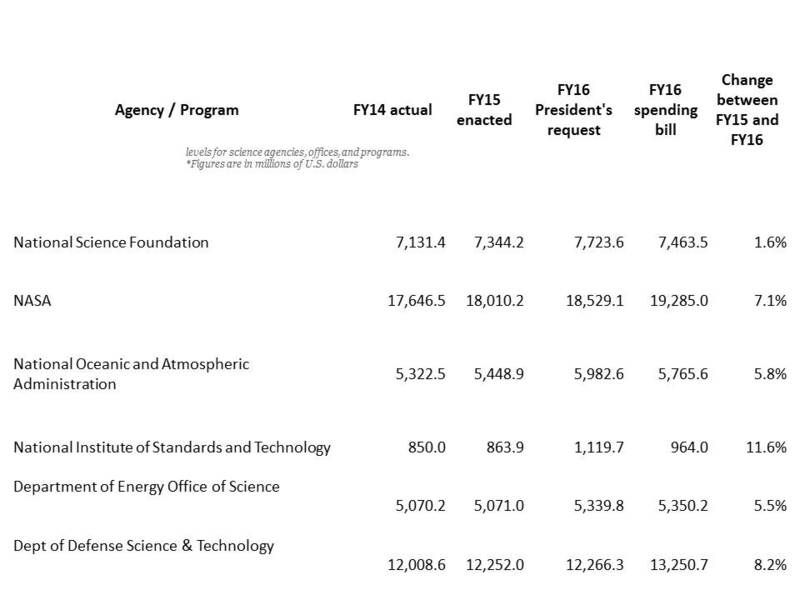 On the face of it, 2016 funding for the physical sciences generally looks strong. What’s more, the details suggest sustained funding for Earth observations from satellite platforms and for geosciences across the board. (Parenthetically, it appears that threatened cuts to NSF social and behavioral sciences failed to materialize.) In addition, federal subsidies promoting the development and use of renewable energy are also to be maintained. should see the budget glass as substantially better than half-full. Congress is inviting the Earth sciences community to look past the current political rhetoric that marks the 2016 Presidential campaign and any differences between legislative and executive branches about the politicization of science. This budget is strong affirmation of the contributions geoscientists have made to date and faith in the community’s continuing ability to innovate and deliver. The message seems especially positive considering the other claims on federal dollars – entitlements, increased interest rates on the national debt, defense, and rebuilding decayed infrastructure, for example. Scientists and engineers can reasonably continue to focus on the very real task of innovating the country’s way forward in Earth sciences and their application for the benefit of life. Geo-scientists should also be heartened by a second reality. The cost is low. The research and services make up a small fraction (less than 1%) of the federal budget and only 0.1% of US GDP. There’s plenty of room for continuing growth of U.S. investments in the geo-sciences at a rate of 5%/year or more for many years. And that’s framing the geosciences as a cost. In fact, such research, like all innovation, is not a sunk cost so much as an opportunity, returning that U.S. investment many times over in terms of direct growth to the domestic economy, (non-monetizable) protection and enhancement of the ecological services on which we all depend, new foreign markets for American business, and contributions to national security. The Nation has reaffirmed its support for our Earth sciences community and our work. Now it’s up to us to deliver. A quick infomercial: one opportunity for us to jump-start the needed progress is the upcoming 2016 AMS Annual Meeting, scheduled for January 10-14 in New Orleans. Hope to see many of you there. This topic and implicit opportunities are covered in more detail in Living on the Real World: How Thinking and Acting Like Meteorologists Will Help Save the Planet, American Meteorological Society, (2014) (also available through amazon). 4 Responses to Congress signals its intentions toward the geosciences. This is indeed good news Bill. My sincere hope is that some if those funds will be put to good use to put science and innovation to work serving the citizens of our nation. I would love to see the flag held up high in 2016 that tangible benefits were delivered and applied science can save more lives in the face of more extreme weather and an ever increasing vulnerable population. See you at AMS! Pretty simple really: Take money from the failed climate modelers and give it to observers.